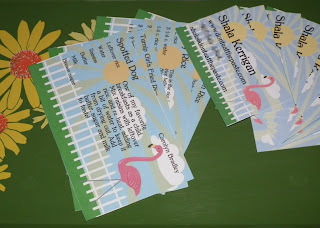 More pink plastic flamingo printables! This time, it's cards that can be used as mommy cards or calling cards and printable recipe cards. Both are in fillable field PDFs. To use them, just open them in your browser if you've got Acrobat Reader installed, and highlight the placeholder text and replace it with your own text. For the recipe cards, they are all set up separately so you can put 4 different recipes on them. For the calling cards, when you fill in one field, that field on the rest of the cards will fill in. You can save them after they are filled in. I always do my test prints using the Reader instead of using Acrobat to make sure it turned out right. Print on card stock then cut them apart using scissors, a paper trimmer or a craft knife and ruler following the crop guides on the sides and corners. Links I'm loving, Micropublishing and Tesla!